Don Dempsey, Meghan Dempsey and Roger Perry pose for a photo at Gunshooters in Millsboro. For Roger Perry, work is just something he does. The Riverdale/Oak Orchard native joined the United States Army a few days after graduating from Millsboro High School. He thought he was ready to try something else after returning stateside from a tour in Vietnam but decided to go ahead and re-enlist in the Army National Guard. He became a signal warrant officer, and eventually ran the Bethany Beach training site for approximately 10 years. Perry ultimately served as command chief warrant officer for the entire state of Delaware, and went to work as special assistant to the command chief warrant officer of the Army Guard — making him the second-highest-ranking warrant officer in the entire Guard, before he ultimately retired in September 2010 after 42 years in the military. “The next day, I went in to the repair shop and got back to work,” said Perry, with a small laugh. That repair shop was a gun-smithing operation Perry ran from his Georgetown property. He eventually added his grandsons, Jordan and Connor, to the operation, and while Connor ultimately moved on to pursue a career as a golf professional (“I strongly encouraged him to pursue that dream,” said Perry. “It’s something he really wanted.”), Jordan continues to work with his grandfather. The family gun-smithing operation was going well for Perry. In addition to his grandsons, Jordan’s friend Travis joined the team and has been an active member for about five years now, according to Perry. The company was doing repairs for about a dozen gun shops around the county, according to Perry, and was doing so well that they opened a retail location in 2015. 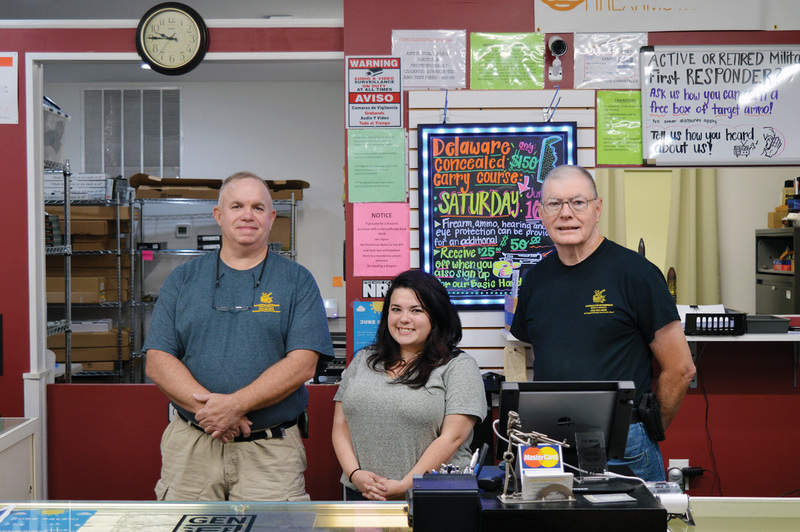 Always moving forward, Gunshooter Enterprises moved into its current location on Main Street in Millsboro in 2016 — and they could be there a while. Like many gun shops across these fruited plains, Gunshooter Enterprises sells firearms ranging from handguns to shotguns to rifles, along with the ammunition, holsters, safes, cleaning equipment and everything else a responsible gun-owner would require. What sets them apart is the display of M1 Garands — a .30-caliber semi-automatic rifle that saw action in World War II, the Korean War and some stages of Vietnam. With the opening of the retail shop, Perry hired Don Dempsey, a retired Wilmington police officer, and his daughter, Meghan, who does a lot of the shop’s office work, as well as their social-media presence. Perry’s wife, Bonnie, also comes through the office to check on their paperwork. Gunshooter Enterprises also offers training courses. There is a basic handgun course, which Perry says is mostly one-on-one training with an instructor who teaches about safety and maintenance of the weapon. The concealed-carry class is once a month, and is part of the requirements for obtaining a Delaware Concealed Carry Deadly Weapons (CCDW) permit. The store is also friendly to first-responders, with each first-responder receiving a free box of ammunition with the purchase of a firearm. “We try to take care of our officers,” said Perry. Gunshooter Enterprises does a monthly drawing for a $100 certificate to use in the store, a “coveted gunshooter.com” baseball hat with every purchase of a gun and a “No B.S. Warranty” for purchases. Each used weapon sold by Gunshooter is test-fired at a bullet trap at their Georgetown facility. “All of our used guns have been test-fired and safety-checked before they are put out for sale,” professed Perry. Was there any doubt that a 42-year veteran would double-check everything? Gunshooter Enterprises is located at 240 Main Street, in Millsboro. Their new website is at www.gunshooter.com, and their phone number is (302) 663-0838. They are open 10 a.m. to 5 p.m. Monday through Friday, and 10 a.m. through 4 p.m. on Saturday. They are closed on Sundays.